I’ve been spending some time working on John’s cardigan this week. I think I’m making pretty good progress. I still need to work about two inches until the shoulder shaping. I’ve also been making more soap. 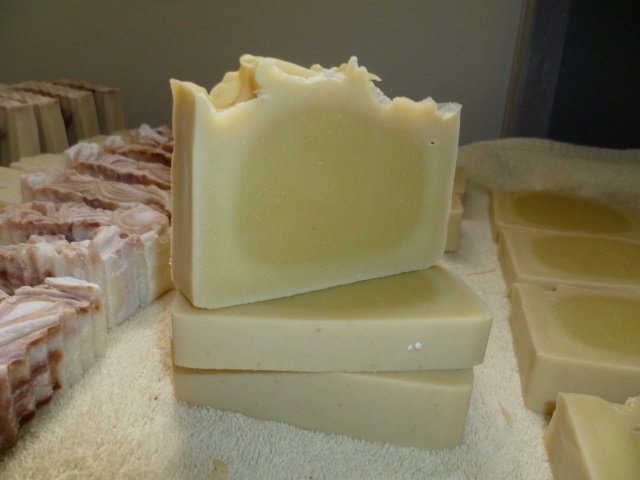 This week’s batch is another batch of the BNA Blackstrap Ale soap. I’m really pleased with how my soaps are turning out. They look good (in my very humble opinion); they are not strongly scented (I don’t like overwhelmingly scented soaps); they lather (that’s the important part!). The colourant in this one is, once again, cocoa for the bottom part and titanium dioxide to make the foam, along with a hanger swirl to make the “foam” swirl. You’re probably wondering about the title of this post. 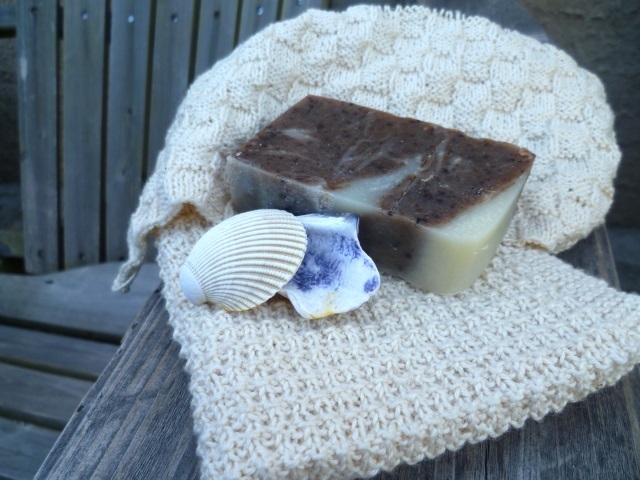 What does it have to do with knitting and soap? Nothing, really. It is, however, relevant to my family’s experiences this past week. It’s a reminder not to focus on the difficult times, a reminder that there is another day coming, a day that will bring new beginnings, new experiences, even, perhaps, joy. Right now, joy is difficult to imagine. My family is hurting this week with a pain that will never fully go away. On Tuesday afternoon, my eldest grandson, Zachary, was found dead in his apartment. I will not go into details other than to say he and his roommate were both found deceased. Until the cause of his death is known, we’ll have to wait for a funeral. Please, if you pray, keep us in your prayers. Both his parents are, justifiably, devastated. We all have a hole in our hearts that will never completely heal but we do know that sun will rise tomorrow and our lives will go on. It’s been… hmm… I was going to say that it’s been a quiet weekend so far but it hasn’t, really. On Friday, our kitchen baseboard heater decided to stop working… again. It does this every year – works for a week or two, then stops working for the rest of the year. We’ve been lucky enough to have an extra space heater that we’ve been using but it has decided it’s usefulness had expired this year and has now become nothing but garbage. We let the landlord know about the heat situation and, on Friday night, K showed up to check the heater, the wiring, and whatever else he could determine. Yesterday, he and the landlord came by with a new heater to install but there seems to be some kind of an issue with wiring so, for the moment, we have no heat in the kitchen. Thankfully, it’s not yet cold enough that it’s an issue but it has made for a busy kitchen. By the time I returned from my shopping trip, there were three men and two dogs in my kitchen, with furniture all over the room, making it something of an obstacle course. Later, Kristen and the kids came by for a fire and some roasted marshmallows. They even brought “coloured fire”, some packets of chemicals that you throw into the fire to make some fun and funky colours. I think it would have been more effective if we’d waited until dark but it was fun anyway. After a few marshmallows each, Kristen suggested we all go out for dinner and she managed to talk John into it. After a bit of discussion, we ended up at the Mission Tap House; if you’re in Kelowna and looking for a decent place to go for a meal, try it; everyone enjoyed their meals. I was the only one with leftovers, only because I really wasn’t all that hungry, not because it wasn’t good. I even managed to get a batch of soap made. I’ve been watching a video channel (Soaping 101) and she’s made a couple of videos in which she takes a popular brand of soap (in this case, Dove) and breaks down their ingredients, creates a formula and makes a copy. I decided to try her recipe, now that I have all the supplies on hand. I added a scent (ylang ylang – just a little bit) and a little bit of silk protein, just because I still have some. Before we even left for dinner, I was able to remove the soap from the mold; it was still a bit warm but already quite hard. By the time we got home, I cut it. Had I waited until this morning, I think it might have been too hard to cut! Do you see the white flecks in the soap? That’s from the titanium dioxide I used to colour half the batter. It’s nothing but cosmetic, just a little bit of interest in an otherwise pure white bar. It needs to cure for at least 3-4 weeks but I’m looking forward to trying this soap. And, in case you’re wondering, yes, there has been knitting. I have about 12″ done on the back of John’s sweater and I’ve started the third ball of yarn. 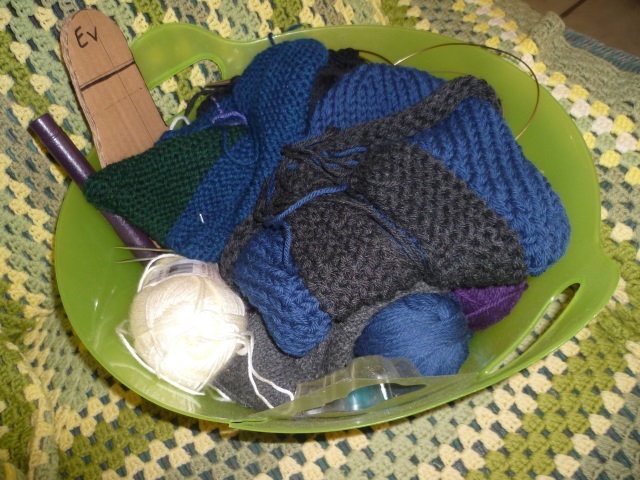 At this point, apart from 12″ of straight on knitting, there’s not much to see. Imagine the last picture, doubled, and you get the idea. Today, the plan is to make another batch of the first soap I made, the Coconut Milk soap, my personal favourite so far. After that, it’s all up in the air but I do anticipate some progress on John’s sweater. Email me your relevant information, Heather, and six samples of my hand crafted soaps will be making their way to your doorstep, along with an extra surprise or two. Congratulations! Yesterday, Beth asked how she might be able to subscribe to my new soaping blog by email. This morning, I figured out how to add that to the blog and there is now a spot to subscribe by email… for anyone who would like to. This is how the soap turned out, by the way. It’s a nice hard soap that was hard to cut. It did gel but not completely; that won’t affect the final product, just the aesthetics. Considering that it’s soap and will all be going down the drain eventually, I’m not overly concerned about it. I did do a little more knitting on John’s sweater yesterday; I have about 6″ done so far. Right now, it’s straight up the back for 17.5″ before starting the armhole shaping. I don’t think much knitting will happen around here today; there is lasagna to be put together (I made the meat sauce yesterday) and a dinner to prepare for. John’s planning on making a cheesecake for dessert, using a recipe his mother received years ago from a NYC native. I’m looking forward to it; he’s never made it for me. This is a traditional, basic, baked cheesecake with the cherry pie filling on it. Yum! It will be a lovely finish to our dinner, I think. Now, it’s an absolutely gorgeous fall day around here. We had a bit of a wind storm last night; it was an amazingly warm wind that scattered chairs and leaves around the yard. Today, it’s bright and sunny out.. beautiful! It’s time to get motivated and out there! Enjoy your weekend, all, and to my Canadian family and friends… Happy Thanksgiving. Well, it sort of ends now. Today is the last day to get your comments in (on the blog, not on Facebook); I’ll be making the draw for 6 soap samples tomorrow. 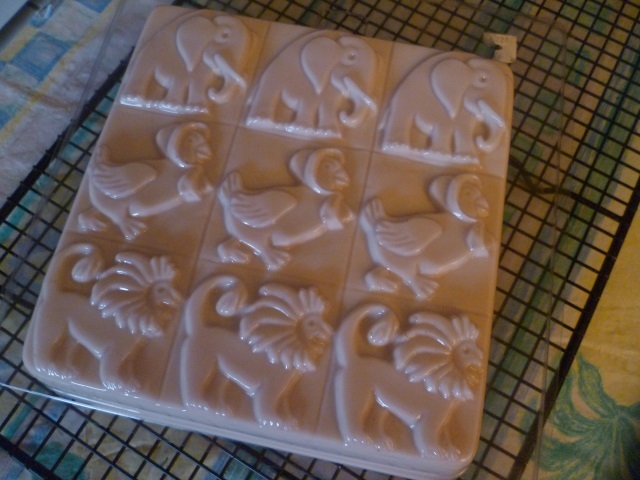 Test pieces for some of my soaps… don’t they almost look good enough to eat? It’s a long weekend here in Canada; we celebrate Thanksgiving on Monday. We will not be doing the “turkey thing”; I’d rather have a nice quiet weekend without the hectic busyness of cooking a full turkey dinner. That’s not relaxing at all, thankyouverymuch! I was thinking of putting together a big pan of lasagna, to be honest. Not very Thanksgiving-ish, is it? Certainly decadent, though! I have every intention of filling the weekend with knitting related stuff. I have a book on the iPod (The Confessor by Daniel Silva) and a couple of projects on the needles; I am ready to relax! 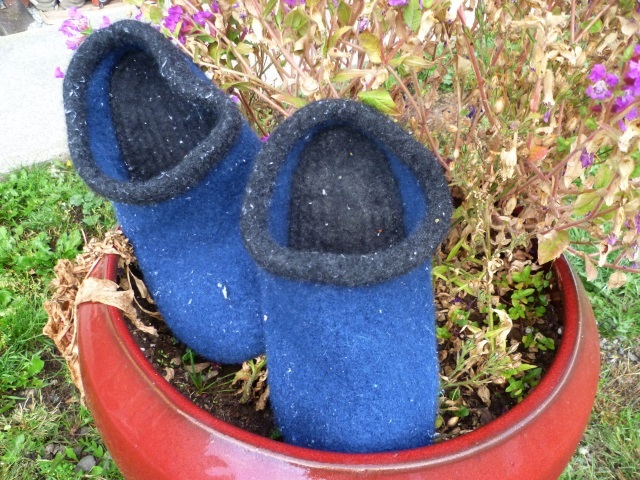 First though, John’s slippers are finished… the knitting and the felting, although I will have to throw them back into the washer to felt a little more. For some reason, one slipper felted more than the other. My washer isn’t the best one out there, that’s for sure. I get lint on everything, and I do mean everything! I’m leery of washing anything white because I’ll end up with dark lint streaks on it; I’m afraid of washing anything dark because I end up with light lint streaks all over it. It’s rather frustrating, to be honest. In the case of the slippers, though, at least we can brush the lint off. Because John’s slippers are finished, I’ve allowed myself to start his sweater. I’ve gone through one ball of yarn so far and that’s just knitting a few rows each evening while watching a show or two on the computer (we don’t have a tv… by choice). The stitch pattern is an easy one to memorize and read and, as you can see, knits up fairly quickly. The yarn feels really nice in the hand and makes a cozy fabric. I don’t think he’ll be at all disappointed with this cardigan. I’m already a little jealous. I also have another small project on the needles. 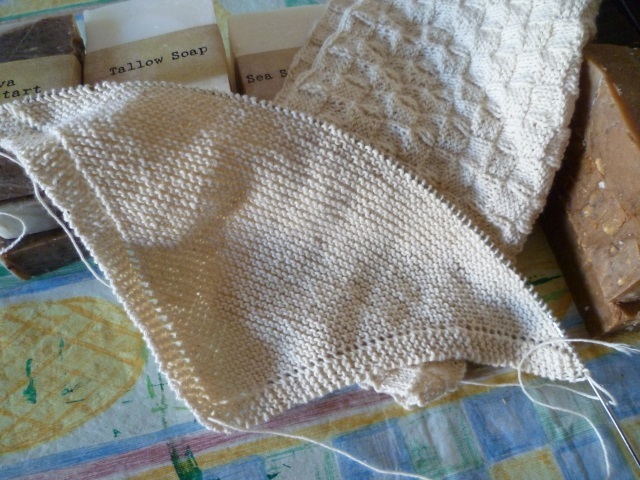 I’ve decided I like having a face cloth on the go; they’re the perfect small project – they knit up fairly quickly, even with fine yarn, and they’re a usable little item. I don’t especially like using them in the kitchen but I do like using them on my face. This time, I’m using Paton’s BumbleBee baby cotton, a 100% cotton, DK weight, that I do believe has been discontinued (yup… just checked; it was discontinued in 2005… and, yes, I’ve had it that long!). It’s a very soft cotton, nice to work with and knits up beautifully. I have about a half dozen or so balls of it so there will be a few of these face cloths in my linen closet before too long, or they’ll be given as gifts, accompanied by a bar or two of handcrafted soap. Speaking of soap, I don’t think there will be any soap making this weekend; I’m out of coconut oil and I’m waiting for an order of a couple of items to arrive from Voyageur Soap & Candle in Vancouver. I could just run out and pick up some more coconut oil but soaping isn’t high on my priority list this weekend. One of the things I’ve learned in my foray into soap making is that you WILL make ugly soaps – not intentionally, mind you, but you will make them. I have one soap that I wouldn’t even consider sharing with anyone, ever. 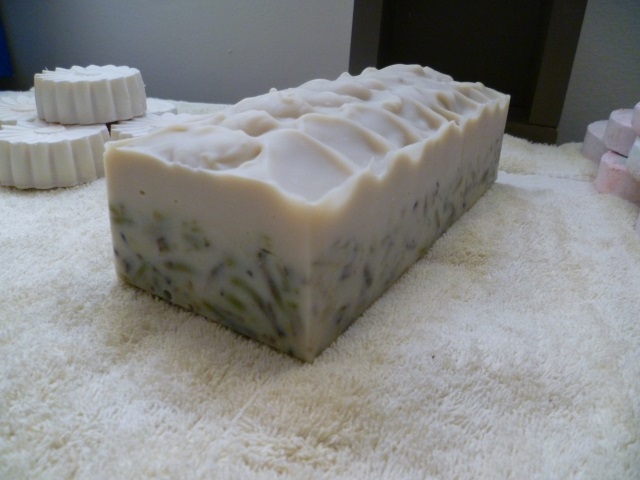 This is a peppermint/rosemary soap I made at the end of August. That batch was cursed from the beginning. The recipe called for way too much of the peppermint leaves, it never got hard and there’s so much peppermint oil in it I could use it as a substitute for Vick’s VapoRub. Seriously, a fail all around. 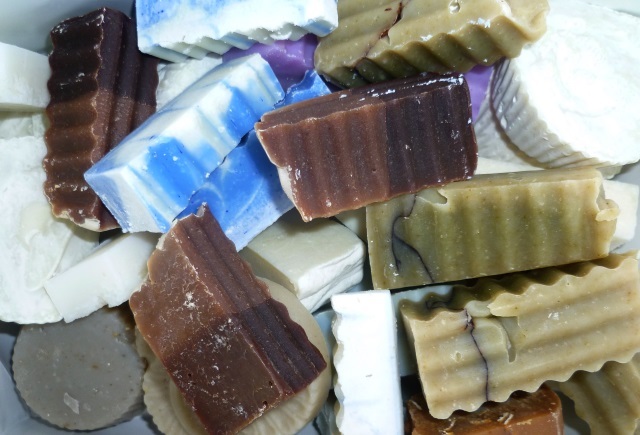 I went to the Soap Making Forum and started reading about rebatching and confetti soaps and anything else I could find about turning ugly soaps into a usable and, possibly, even pretty soap. Or, at the very least, better looking. Here’s the result of my reading… and learning. The new, and very much improved, Peppermint Soap. 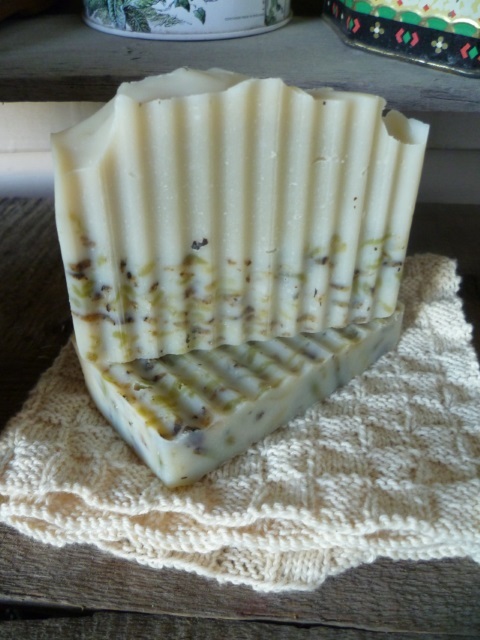 I grated up three bars of the ugly peppermint soap, made a batch of coconut milk soap, poured about half the batter into the soap shavings, mixed it well and poured that mixture into the mold. 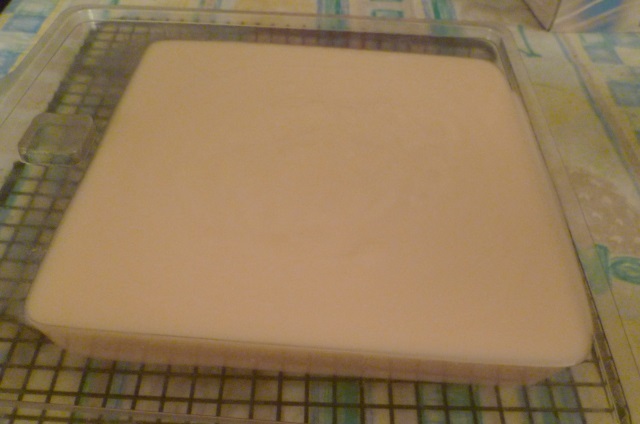 Then, carefully, I poured the rest of the soap batter over the base and made the top pretty. It gelled completely within a couple of hours and, by this morning, was hard enough to unmold and cut. 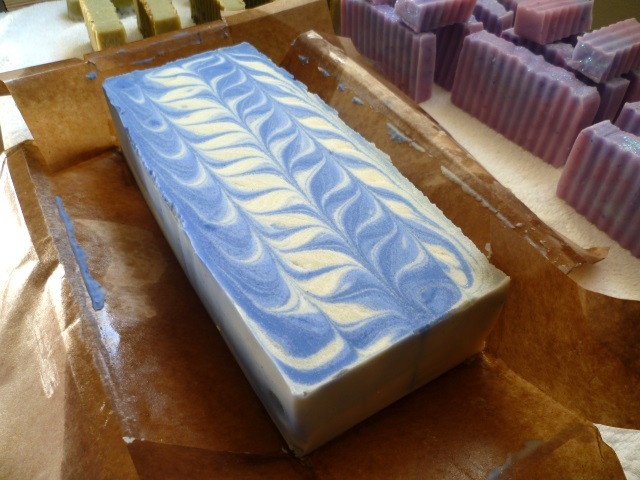 That is a much prettier soap than the original soap, wouldn’t you agree? Just for the sake of comparison, here’s a picture with both bars. I’m looking forward to trying it in about a month. It still smells very minty but not as strong as the original. I think this will be a great “wake me up in the morning” kind of soap. I just need to practice some patience. Speaking of patience, I also need to learn patience when it comes to unmolding my soaps from the silicone molds. They do take a little longer to firm up, I find. I’m not sure why, really. 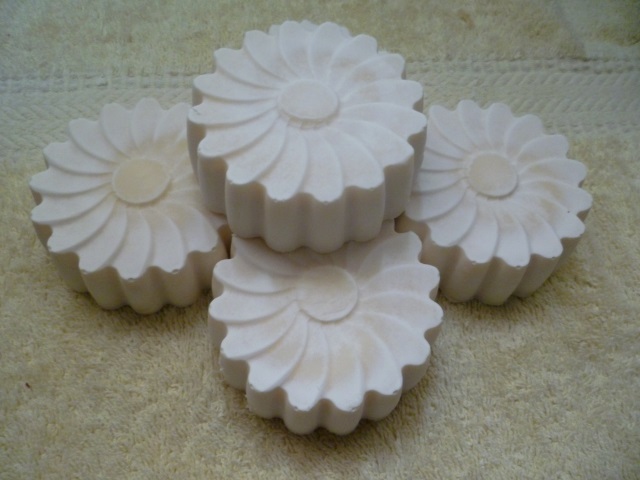 These are the soaps from the daisy mold. I love them but I did damage two of them by trying to take them out too soon. I should have waited the full 24 hours or longer. Ah well… a couple of uses and you won’t see the flower anyway. And it’s not as if they’re for sale. They sure are pretty, though, and I think the recipe is a good one. We’ll see how it hardens within the next couple of days. Today, I’ll be trying a new (to me) technique, a feather swirl. John’s out right now, trying to make a tool for that purpose. It uses a hanger (yes, a wire coat hanger) or something a little thicker. I found something that will, hopefully, work but it needs shaping; John’s taken it to his work shop to bend it in the vise they have there. The technique creates a feather inside the soap using 3-4 colours. It’s the October challenge over on the Soap Making Forum and I’ve decided to enter; I’m really looking forward to seeing what everyone comes up with. Ok, time to stop procrastinating; there are dishes to be done, slippers to felt (yes, I’ve finished the knitting; I just need to stitch them up and felt them), soap to design, a letter to write. Today’s going to be a full day! You have one week left to enter to win a 6 pack soap sampler. Leave a comment and you’re entered! 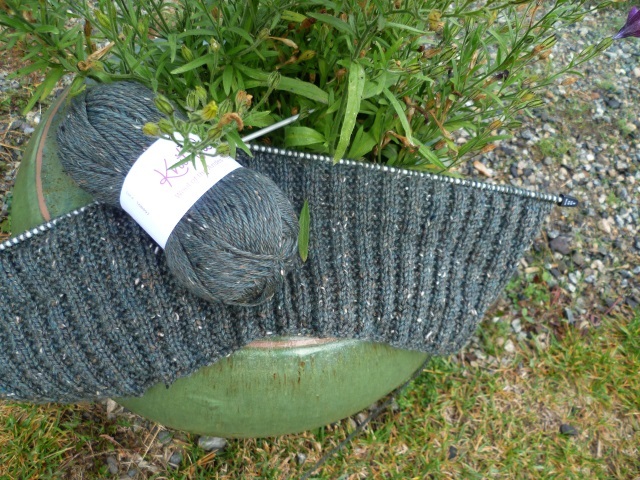 Last week, I left you with a teaser about an upcoming work in progress – a cardigan for John. When the newest KnitPicks catalog arrived, I showed John one of the pictures of a man’s cardigan that I thought he might like. He wanted to see more so I brought up the KP web site and showed him the rest of the pictures there. He liked it. He liked it a lot. When I asked him if I should purchase the yarn and pattern, he said yes! I didn’t wait! The yarn was ordered and has already arrived. I have been told, though, that I am not allowed to start the sweater until his slippers are finished. Yeah, they’re still not done. The pattern is the Hidden Light Cardigan; to see more pictures, click here. 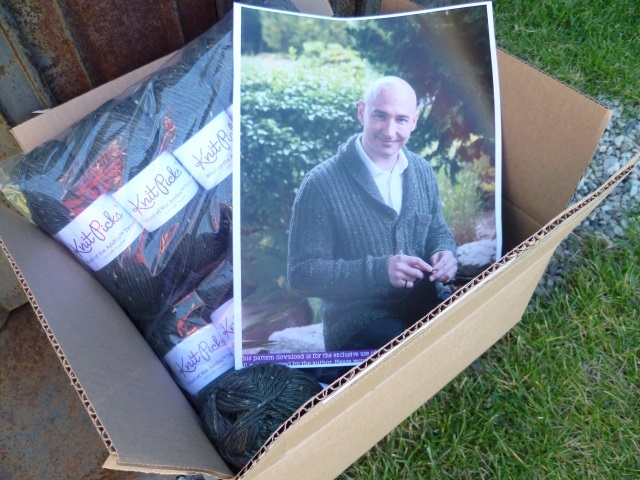 When I showed John the colour choices in the yarn, he pointed to the picture and said, “That one.” Apparently, he really likes that cardigan in that colour. I like it, too, so we’re going with it. I’ve already done a test swatch (just a swatch, that’s all!) and my gauge is right on so I’m good to go… as soon as his slippers are done. This weekend is a weekend without grandchildren around so I’m getting a few things done. Once I’m finished with this post, I’ll be knitting. Care to guess what I’ll be working on? Already today, I’ve been out – had my hair cut this morning, wandered around the farmer’s market, did some shopping, picked up a new mold for my soaps, stuff like that. 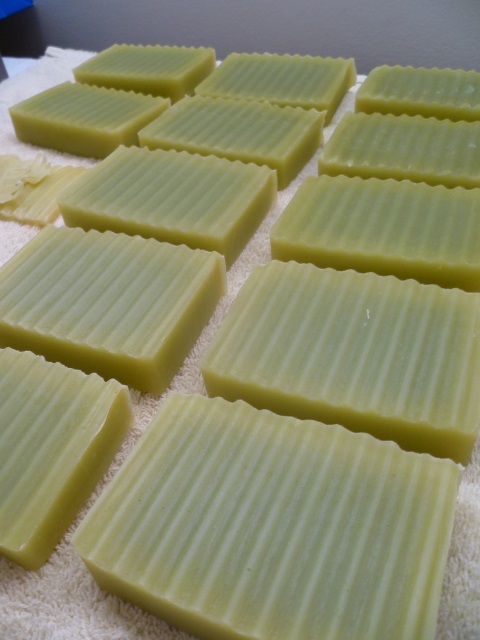 Just before I sat down to write this post, I made a small batch of soap to fill my new mold… and a few more molds. 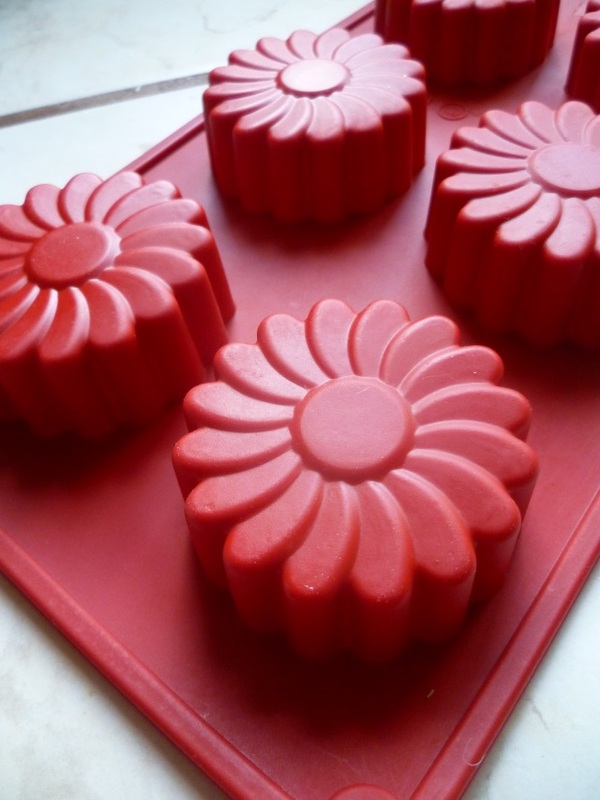 I love the Fat Daddio’s silicone molds; the flower molds are so pretty. This one is the daisy; I have my eye on the sunflower, the narcissus, and the rose molds as well but those are a special order. I made a small batch of soap with sunflower oil, superfatted with 1 teaspoon of argan oil and scented with the last of my neroli essential oil. It’s setting now and I can barely wait to see how it comes out. The recipe this time is one of my own devising. Now, I’m done here for today… I’m off to get comfy and finish those %*$(&^# slippers. And I’m feeling like it’s already getting away from me. There are so many things I want to do but, so far, not much is getting done. Well, I shouldn’t really say that. After all, I did make a small test batch of soap for myself (using 12 ounces of oils) and I did get some shopping done, including the purchase of a cake for a certain someone’s 60th birthday on Monday (but you didn’t hear it from me). 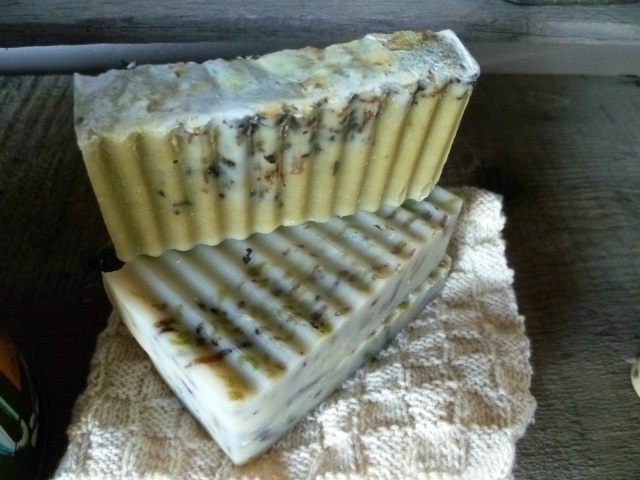 …is a recipe I designed as a face soap, with lots of moisturizing, pampering oils (like cocoa butter, rice bran oil, coconut oil, and olive oil). 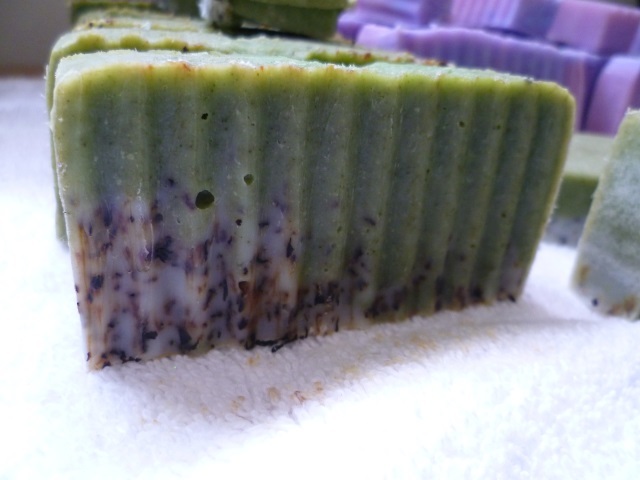 The colorant is spirulina, which turns the soap a lovely shade of green. Right now, it’s still too soft to remove from the carton but I’m itching to get it out and see how the swirling worked out. 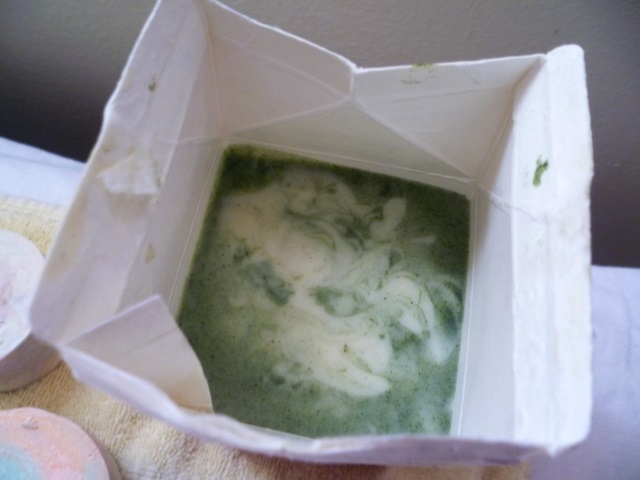 To create the swirl, I used about one quarter of the soap batter, incorporated the spirulina into it, and poured it back into the soap pot before pouring the whole batch into the carton. I’ve scented the soap with the last of my sandalwood essential oil (there wasn’t much left). 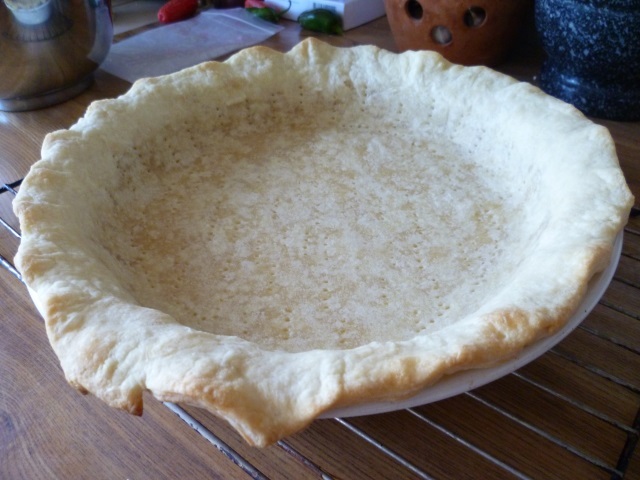 I’ve also blind baked a pastry shell for the quiche we’re having for a birthday lunch tomorrow. And I’ve cleaned out the fridge. Lunch tomorrow will be Quiche Lorraine. I decided to blind bake (bake ahead of time) the pastry so it’s one thing I won’t have to do tomorrow. I did have a nice fluted edge on the pastry but that kind of melted. Oh well, it’s all in the flavour, right? Still on the slate for today or tomorrow… finish John’s slippers. I got absolutely nothing done on them this past week. Two soles… that’s all I have left to do. In my defence, we did have company this week and the slippers take a good deal of concentration. I did do some knitting, though. The checkerboard face cloth is off the needles and I’ve started one of the ubiquitous garter stitch face cloths. I much prefer it in the finer yarn, to be honest. The chunkier ones are fine for dish cloths and such but for a face cloth, I do like the texture and feel of the finer yarn. Plus, it’s mindless knitting… never a bad thing. Well, this post is taking a lot longer to write than I’d anticipated. It’s now Sunday morning and I’m already thinking about what needs to get done before Kristen and the kids get here for brunch. While they were out rollerblading yesterday, I made another batch of soap. This one is a hemp soap. I love the colour! This morning, I’ve unmolded and cut it and I’m really happy with it. I’ve tried lathering up a small end cut and it lathers beautifully. I really think I have a winner with this one. I wasn’t sure what to scent it with so I’ve left it unscented; I don’t mind unscented soaps, especially if it’s something I’ll be using on my face. 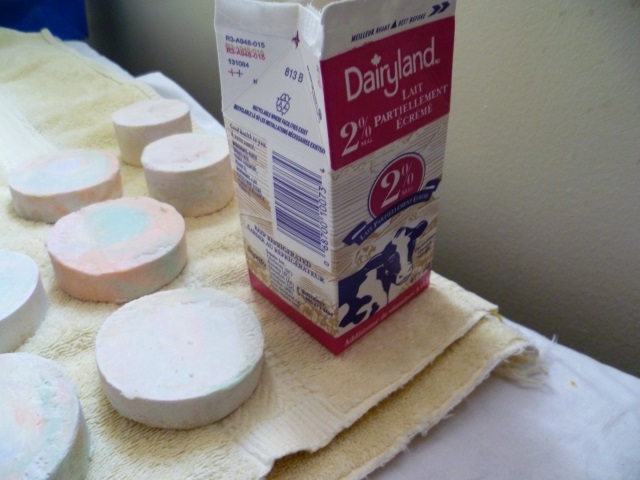 And the Spirulina soap, out of the milk carton and cut? I’m really pleased with the way the swirl came out. I haven’t tried lathering this one yet but I am definitely looking forward to trying it. Now…. time to do some prep on our brunch. Quiche Lorraine coming up. I’ll tell you about John’s new (upcoming) cardigan another time. I know this is my second post today but I’m rather pleased with myself and wanted to share. That’s okay, right? And that’s it. At first, that put me off. However, having done a bit of research and reading, I’ve come to really like the percentage way of doing things. Why? Good question. 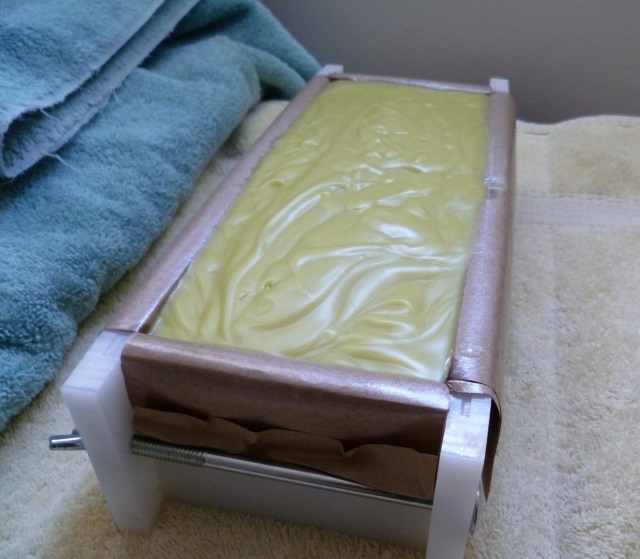 At the moment, I have two log molds; each holds a batch of soap that has 30 ounces of oils. How do I know? Well, there’s a formula for that… width of the mold, times length of the mold, times height of the mold, times .40. (i.e. 9.25″ long by 3.5″ wide equals 32.375… times 2.5″ tall equals 80.9375. Now take that number and multiply it by .40. That equals 32.375; that number would be the total number of ounces of oil you would need to fill your mold. Are you confused yet? Length times width times height times .40 Easy, peasy. So, I have a mold from years ago especially geared to children. It has lions, elephants, and geese in a grid (cut marks). I’d show you but it’s full of soap at the moment and I really can’t turn it upside down to take a picture. I measured it, easy to do as it’s a square mold; I figured that it would take 19.75 total ounces of oils to make a single batch that would fill this mold. Not very exciting from this angle, is it? And that is exactly what I used. I added about 1/2 teaspoon of vanilla oil that I still had from way back and, after all was mixed, poured it into my mold, where it is now waiting to firm up. I’m not going to go into the entire process; there are more than enough good tutorials out there if you’re interested in making cold process soap. I’m just so pleased that I now know how to size a recipe for any mold I might have. Using the percentage method, it doesn’t matter the size of the mold or the size of the batch; it’s easy to size it to fit. 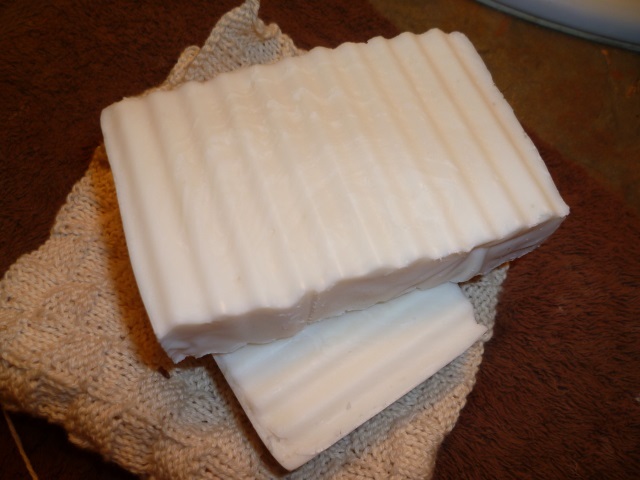 As for the soap, as I wrote, I’ve scented it with vanilla but, other than that, it’s plain… no colour added. It should be a fairly hard, white soap with good cleansing and good lather. Hopefully, it’s something that the grandchildren will like. These are by no means the only ones; a Google search will bring up others. From my own research, these are the most popular lye calculators. Next step? 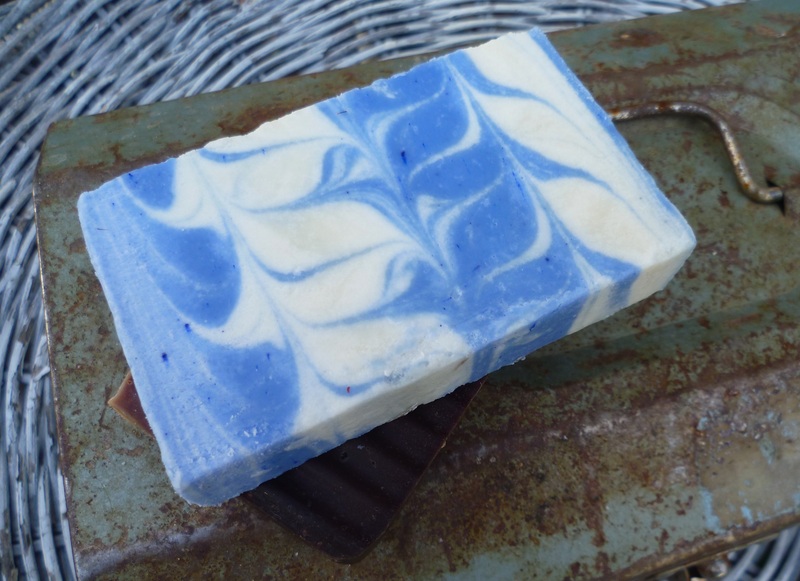 Design my own soap recipe…. one day. When I started posting about the soaps I’m making, Sandie commented that I should make a chocolate soap. I listened, Sandie (so to speak… how do you “listen” to a written comment?). I’ve just been waiting for the perfect recipe. Well, I found it. Unfortunately, it doesn’t smell like chocolate because I couldn’t find any chocolate fragrance oil. It is, though, two shades of chocolate and does include some real chocolate among the oils. The darker layer is coloured with Dutch process cocoa powder while the top layer is just the oils with semi-sweet chocolate. I was attempting to do something called a pencil line – a thin line of another colour – but it didn’t work very well. You can see it but barely; this bar has the most visible line of all of them. 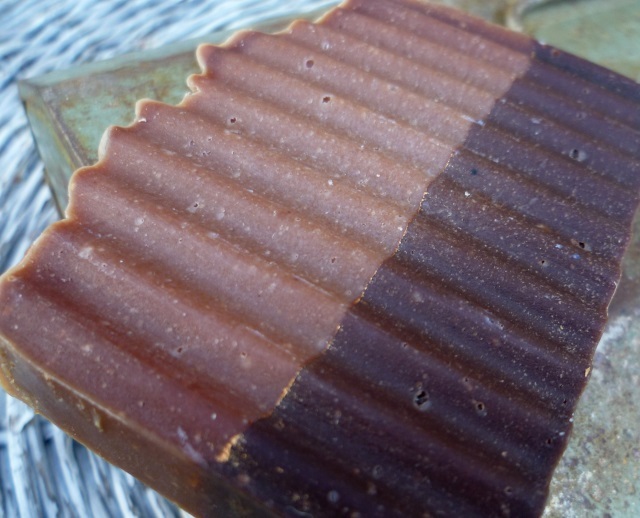 Often, it’s done with a sprinkling of cocoa over one layer of soap with another layer poured on top of it. Apparently, I didn’t use enough of the bronze mica powder I was using. I know for next time. Last night, after cutting the chocolate soap, I also cut the swirl soap. It was still pretty soft and I probably should have left it for another day but…. well, I’m impatient and I really wanted to see how it turned out. I’m satisfied. It isn’t perfect but I do like the look of it. Unfortunately, you can see that the colorant didn’t get evenly dispersed in the oil I used to blend it. I used a small wire whip to mix the oil and the colorant; I should have used more oil, I think, or spent more time getting it thoroughly mixed. Lesson learned. On the whole, though, the technique was fun. I’ll use a different recipe next time, though; this soap, after almost 48 hours is still very soft and will take a good long time to cure. Today, there will be no soap making… I have been told (it’s okay, I hadn’t planned on making any today, anyway). 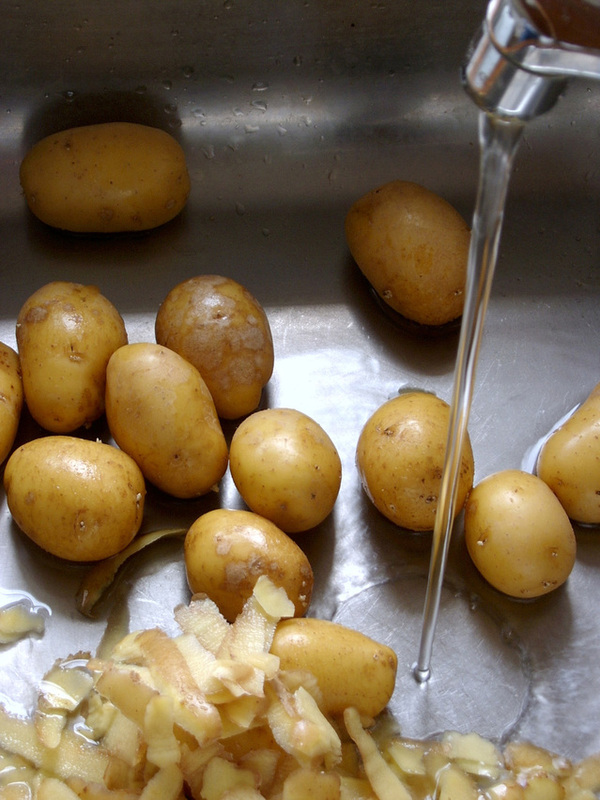 Today, we will be making REAL french fries… fried in beef tallow. Which John doesn’t mind buying, now that he knows that our local butcher carries rendered beef tallow. Which I like using in soap. Which makes THE best french fries ever. That is a win/win in my book. The Waffle Stitch face/spa cloth is finished! It only took a little over a week to finish one cloth – that actually surprised me; it felt like it took forever! I do have to say, though, that I’m really happy with it. It has a very nice feel to it, not thick but still cushy, with enough texture to help exfoliate and stimulate the skin without being rough. Now, we’ll have to see how it stands up to use. Looking nice is one thing, performance is another. 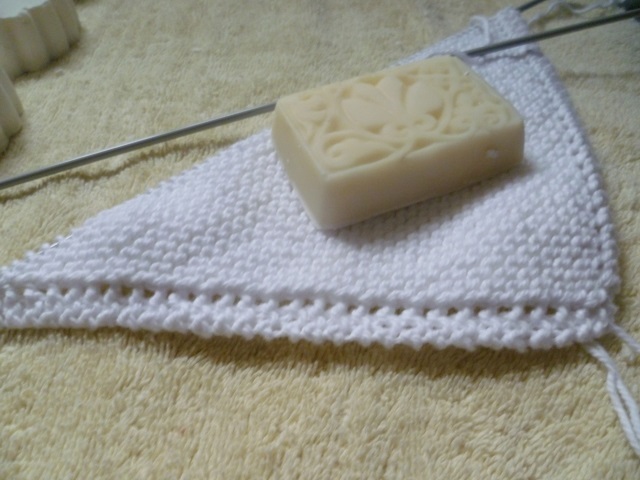 I’ve also cast on for another face cloth; I figure that if I have the yarn and needles out, I may as well keep going. I think I know a few people who will appreciate these. This time, I using a checkerboard stitch, 5 knit stitches, 5 purl stitches, 6 rows, then alternating the knit and purl stitches. I’m really liking how this one’s working up, too. The soap in the picture, incidentally, is the Java Jumpstart soap, one of my favourites (who am I kidding? They’re all my faves!). This one has the most amazing scent and so far, everyone who smells it, wants it. I chose not to add any scent to this one because I wanted to see how it turned out. 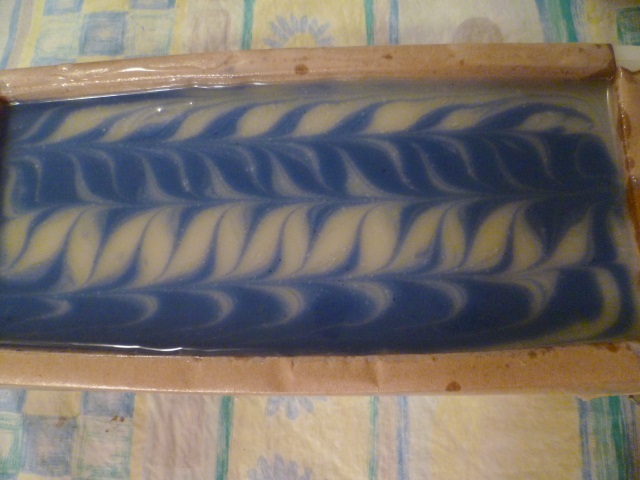 If/when I make another swirled soap, I will definitely add some scent to it. To be honest, it takes almost as much time and thought to decide what scent to use as it does to plan and make the soap. It’s one of the reasons most of my soaps aren’t scented. That, and the fact that I don’t care for perfumed things on or near my face. This morning, I took the soap from the mold; it’s still too soft to cut but I anticipate that I’ll be able to cut it tomorrow. 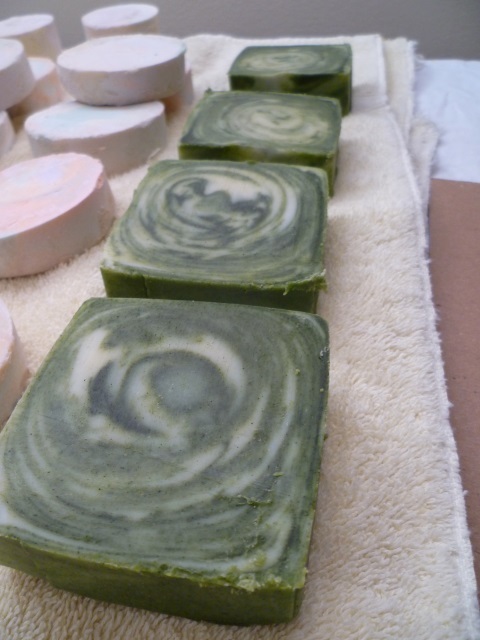 I am really eager to see how the swirls look inside the soap. Normally, I cut my soaps in about nine bars, straight down. In this case, the recommendation is that you first cut about four bars across the mold, then cut each of those bars horizontally. That way, the swirls you see on the top become the sides of the bar. If that sounded confusing, just wait for the pictures. Back to where we started… knitting. The weather here definitely has autumn overtones. 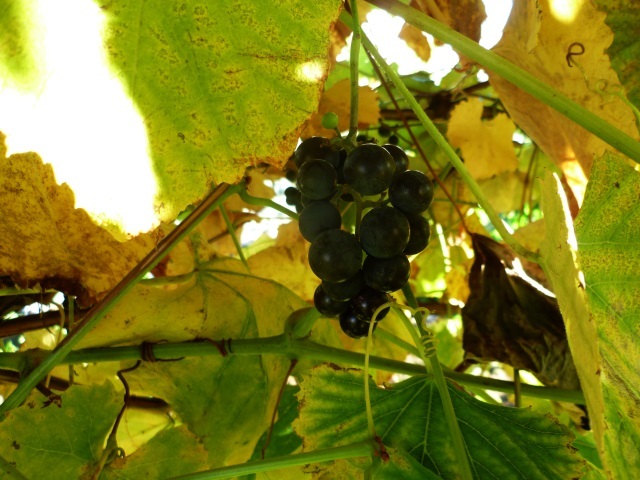 Mornings and evenings have that unmistakable coolness that comes with the changing of the season. Another sign that autumn is on its way is the fact that John’s been whining about not having slippers to wear. That should be remedied by the end of the weekend. I started his slippers last February; they’re almost done. I think I only need to work one more sole, then put them together and felt them. I’m making a point of getting them done and off my plate. Then, I can start on a pair for me!